Pulse oximetry has become the standard of care for the detection of hypoxemia during endoscopic procedures, despite the fact that significant alveolar hypoventilation may be undetected by measurement of arterial oxygen saturation (SPO2), particularly when supplemental oxygen is administered. Exhaled carbon dioxide (CO2) monitoring (capnography), may be a better option for respiratory depression in all patients who receive sedation, especially deep sedation. Recommendations from the American Society of Anesthesiologists suggest that monitoring for apnea using capnography is a useful adjunct in the assessment of ventilatory status of patients undergoing sedation and analgesia . Qadeer et al. conducted a single-centered, randomized, double-blind study, which demonstrated that capnographic monitoring of respiratory activity improves patient safety by reducing the frequency of hypoxemia, severe hypoxemia, and apnea . 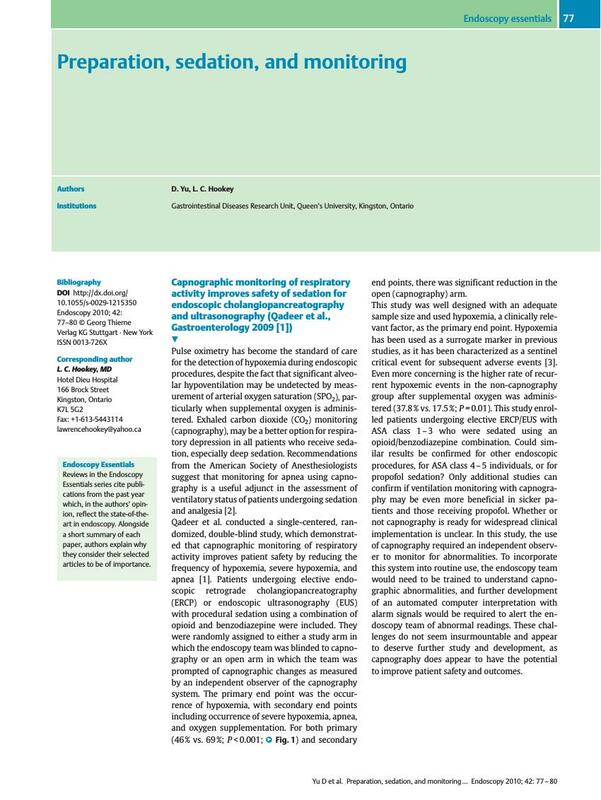 Patients undergoing elective endoscopic retrograde cholangiopancreatography (ERCP) or endoscopic ultrasonography (EUS) with procedural sedation using a combination of opioid and benzodiazepine were included. They were randomly assigned to either a study arm in which the endoscopy team was blinded to capnography or an open arm in which the team was prompted of capnographic changes as measured by an independent observer of the capnography system. The primary end point was the occurrence of hypoxemia, with secondary end points including occurrence of severe hypoxemia, apnea, and oxygen supplementation. For both primary (46 % vs. 69 %; P < 0.001; [Fig. 1]) and secondary end points, there was significant reduction in the open (capnography) arm. Fig. 1 Kaplan-Meier plot displaying time to hypoxemia with capnography in blinded and open arms. This study was well designed with an adequate sample size and used hypoxemia, a clinically relevant factor, as the primary end point. Hypoxemia has been used as a surrogate marker in previous studies, as it has been characterized as a sentinel critical event for subsequent adverse events . Even more concerning is the higher rate of recurrent hypoxemic events in the non-capnography group after supplemental oxygen was administered (37.8 % vs. 17.5 %; P = 0.01). This study enrolled patients undergoing elective ERCP/EUS with ASA class 1 – 3 who were sedated using an opioid/benzodiazepine combination. Could similar results be confirmed for other endoscopic procedures, for ASA class 4 – 5 individuals, or for propofol sedation? Only additional studies can confirm if ventilation monitoring with capnography may be even more beneficial in sicker patients and those receiving propofol. Whether or not capnography is ready for widespread clinical implementation is unclear. In this study, the use of capnography required an independent observer to monitor for abnormalities. To incorporate this system into routine use, the endoscopy team would need to be trained to understand capnographic abnormalities, and further development of an automated computer interpretation with alarm signals would be required to alert the endoscopy team of abnormal readings. These challenges do not seem insurmountable and appear to deserve further study and development, as capnography does appear to have the potential to improve patient safety and outcomes.